What is the Product Property of Square Roots? The product property of square roots is really helpful when you're simplifying radicals. This property lets you take a square root of a product of numbers and break up the radical into the product of separate square roots. 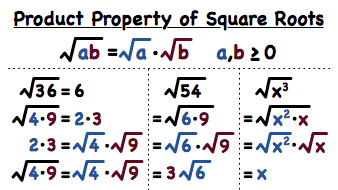 Check out this tutorial and learn about the product property of square roots! Factors are a fundamental part of algebra, so it would be a great idea to know all about them. This tutorial can help! Take a look! You can't do algebra without working with variables, but variables can be confusing. If you've ever wondered what variables are, then this tutorial is for you! How Do You Square a Number? Want to square a number? Just take the number and multiply it by itself! If you square an integer, you get a perfect square! Check out squaring in this tutorial! Anytime you square an integer, the result is a perfect square! The numbers 4, 9, 16, and 25 are just a few perfect squares, but there are infinitely more! Check out this tutorial, and then see if you can find some more perfect squares! How Do You Simplify Radicals Using the Product Property? Want to simplify a radical whose radicand is not a perfect square? No sweat! Check out this tutorial and see how to write that radicand as its prime factorization. Then, rewrite any duplicate factors using exponents, break up the radical using the product property of square roots, and simplify. To see this process step-by-step, watch this tutorial!